If you are new to the Watch and aren’t completely sure whether it’s for you, this model is a good place to start. It has a low barrier to entry with its newly reduced price, and I can personally attest to the fact that it runs watchOS 4 just fine. I’ve used a Series 1 over the last year, and I have been running the watchOS 4 betas for a few months and have the release version installed on it now. It may not be as fast as the new Series 3, and may have a less impressive processor, but it is still dual-core and holds up well with the latest apps and software. I would definitely recommend the Series 1 to anyone who doesn’t need the stand-alone GPS or Cellular capabilities or full waterproofing of the Series 3. For runners, as long as you don’t mind bringing your phone along for your runs, then the Series 1 shouldn’t hold you back. Swimmers will need to aim higher if they want to track their performance with an Apple Watch. For anyone who might be considering buying a used Series 0 (the original first generation Apple Watch), I would caution against it at this point. I haven’t upgraded my wife’s Series 0 Watch to watchOS 4 yet (she is in no hurry to do so), but with only a single-core processor, I imagine that it won’t be nearly as snappy. Also, any Series 0 is going to have an older battery with more wear on it at this point. If the $249 starting price of a Series 1 is an issue, then look for a good sale price as we approach the Holidays. I would also recommend that you keep an eye on BestBuy’s Open Box specials, as they can often be $50 or so less than retail while still having a one year warranty from Apple. This will be a better value for you in the long run. One drawback to the Series 1 is that Apple has now limited the color and band choices in the lineup to two options (Silver with White Sport Band and Space Gray with Black Sport Band) since it is now positioned as the “value option.” For those buyers who the fashion of the Watch is important, this could be a factor. This could also be another good reason to look at a place like BestBuy, which may be clearing out color and band combos that are no longer available new using their Outlet. Starting at $329, this model is the new “default” Apple Watch, in my opinion. Apple delineates it’s status by making this model available is a wider variety of color and band options. Technically speaking, the Series 3 has the S3 processor and W2 wireless chip, both of which bring greater performance. It has a brighter screen, It has full waterproofing that allows for swimming and diving, and it has both stand-alone GPS functionality for better tracking of movement, and a new altimeter that tracks climbing and elevation. 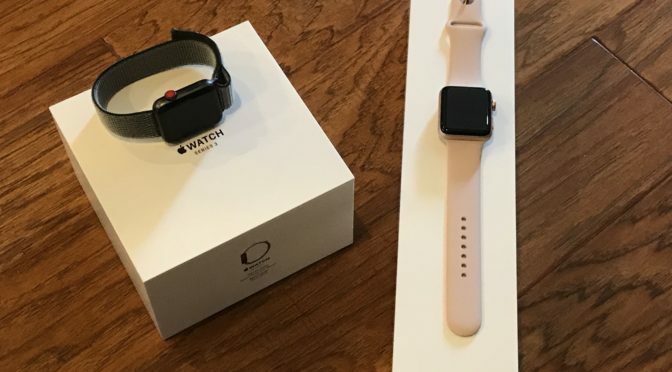 While the Series 2 was only a necessary upgrade for small groups of people, it wasn’t enough for most typical Watch users to have to upgrade to last year. However, in my opinion, the Series 3 + GPS adds enough new features in the beefed up (and more efficient) processor and altimeter to be the better general purpose Watch option this time out. The speed difference between it and the Series 1 is much more noticeable than the difference between the Series 2 and 1 was. Another thing to consider is the much wider variety of color, material and band option available with the Series 3, which pertains not just to fashion interest, but also a couple of other areas I will touch on in a moment. While this model of Apple Watch may be the new hotness, the LTE radio is only feature that sets it apart from the GPS-only Series 3. What you have to ask yourself is whether the independence of cellular connectivity is worth an extra $70 of your money. If you are a runner, biker, or swimmer who wants to be able to leave their phone behind and stay connected, the answer may be yes. Certain types of athletes don’t have the market cornered here, either. Anyone who wants to be able to walk away from their iPhone while doing any kind of task, but still stay fully connected, will benefit from this model’s cell connection. The value proposition of the Series 3 with LTE comes down to how much you need smartphone independence and how much you will actually use it. I was going to buy this model regardless so I could review it and experience its performance. However, after my testing, I wouldn’t return it to save $70. I really like having the ability to stay connected at times without the additional overhead and distractions of the phone. So what sets the Nike+ versions of the Series 3 Apple Watch apart from all the rest? Not that much, to be honest. However, since they are the same price as their standard counterparts, I don’t see that as a problem. Basically, you get distinctive band options (the crimson and black Sport Loop is particularly sweet, in my opinion), a Nike-specific watchface, and Nike’s Run Club app preloaded. However, the app is actually available for free in the App Store, so you are basically just getting a unique band and face. 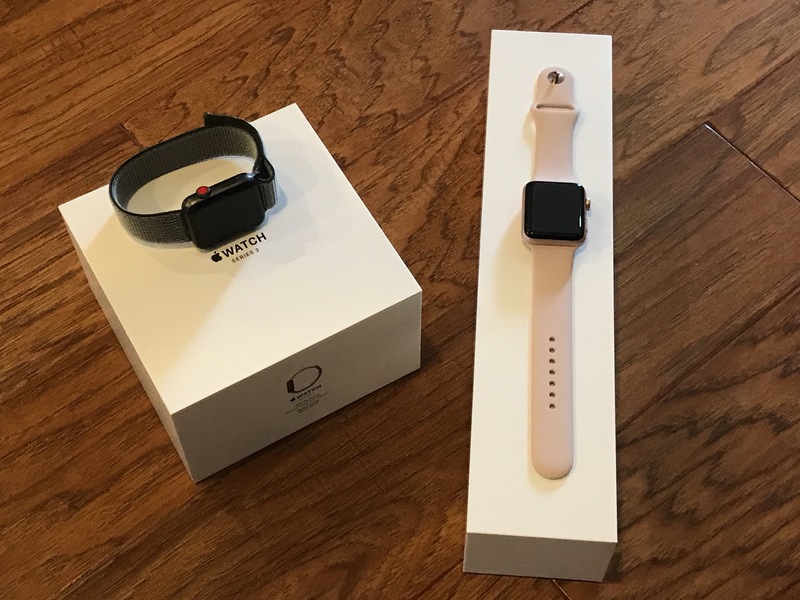 If you are getting either version of the Apple Watch Series 3 and like the style of the Nike+ versions, then you should pull the trigger on one of these models. Not all of the Nike+ bands are offered for sale separately (the Sport Loops aren’t currently available separately), while the ones that come on the standard Apple Watches typically are. Since it will be easier to buy one of those after the fact, if you like the way it looks, get the Nike+ version and enjoy standing out a little bit. In an interesting move this year, Apple has decided to limit the stainless steel and other higher-end versions of the Watch to the top specification tier. These versions are only available with LTE. I guess the extra $70 isn’t a big deal if you already paying at least $200 more than the closest Aluminum models. The only major differences between the stainless steel and aluminum models are the external materials (obviously) and the screen. The exterior of the stainless version are both heavier and harder, which can offer some advantages when it comes to durability. However, the biggest difference is the sapphire covering over the OLED screen. This covering offers much higher degree of scratch-resistance, so buyers do get something in return for their extra money. If keeping your screen free of scratches is important to you and $200 additional isn’t too much to ask for this, then a stainless steel version may be for you. If you can afford to drop $1199 and up on an Apple Watch, then I should take advice from you, not the other way around. I’m not going to pretend that this Apple Watch Buyer’s Guide is definitive above all others, but I sincerely hope that any of you who are still thinking about purchasing one will find it helpful. At the end of the day, let your budget and personal preferences be your guide. As always, if you have any questions or comments, feel free to leave them in the Comments section below, on Flipboard, on our Facebook page, or on Twitter @iPadInsightBlog.